Bogdan Denitch is an Honorary Chair of Democratic Socialists of America, Professor Emeritus CUNY Graduate School, and Chair of Transitions to Democracy. He has been part of national DSA leadership since its founding, is the organization’s representative to the Socialist International, and Chair (since 1981) of the Socialist Scholars Conference. Bogdan Denitch recruited Michael Harrington to the Young Peoples Socialist League in the Spring of 1952. Tim Wohlforth became a socialist in 1953, right at the height of McCarthyism and at the lowest ebb that the American socialist movement had ever experienced. He was a sophomore at Oberlin College in Oberlin, Ohio. I was won to socialism by the Shachtmanites, a group that made up in intellectual vitality for what they clearly lacked in members. We were graced with two socialists — Scott Arden and Bogdan Denitch — from the newly formed Young Socialist League. Neither I nor anyone else at Oberlin College had ever heard of the group. Bogdan Denitch painted a colorful and somewhat exaggerated picture of the YSL. He gave a most astounding interview to the college newspaper. He stated that the YSL’s membership was “under 30,000” and went into great detail about a “training school” the YSL ran to turn out machinists to invade industry and form socialist cells to challenge the conservative union bureaucracy. The newspaper painted the organization as if it were a big Red plot. I found out the truth a couple of years later when I turned up in New York City and needed a job. Two older comrades, Herman Benson and Julius Jacobson, had a small machine shop. If you pleaded with them enough they would give you a fifteen-minute lesson in running an automatic screw machine. Their instruction was rather inadequate; luckily I never had to work in industry. About a dozen students met with Arden and Denitch and decided to organize their own socialist club on campus, which they called the Eugene V. Debs Club, naming it after the famous early leader of American socialism…. DSOC's leadership at the 1979 convention included-Michael Harrington, chairman, Julius Bernstein vice chairman, Victor Reuther vice chairman, Jack Clark national secretary. 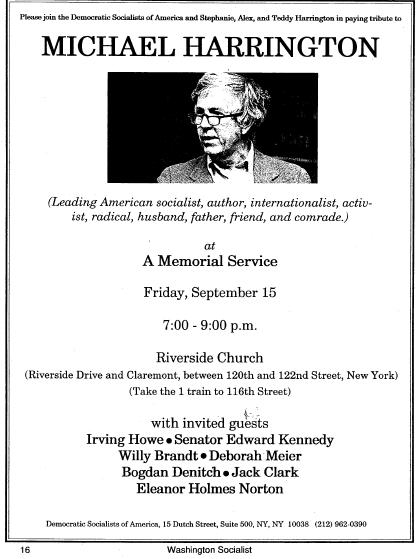 In 1981 John Beverly, Pitt NAM and Bogdan Denitch, DSOC National Executive Committee led a workshop entitled New Developments in the Socialist International at the 10th Convention of the New American Movement. The convention was held in a union headquarters in Chicago and ran from July 29 - August 2, 1981. In 1993 Bogdan Denitch was a featured speaker at the Midwest Radical Scholars & Activists Conference. The theme of the conference was, "Popular Empowerment in the Clinton Era". The conference was held between Oct. 29 - 30, 1993 at Loyola University, Chicago. In 1994 Bogdan Denitch was a member of the Democratic Socialists of America. He was named as Honorary Chair of the Democratic Socialists of America and taught at the City University of New York. In May 1998 Julia Fitzgerald traveled France was a conference sponsored by the educational arm of the French Communist Party, Espace Marx. The conference was part commemoration of the 150th Anniversary of the Communist Manifesto, part call for international analysis of capitalism at the millennium. She attended with several other Democratic Socialists of America members including Honorary Chair Bogdan Denitch (who was a speaker at the conference), John Mason (member of DSA's Internationa] Committee) and Robert Saute and Gina Neff (both members of the City University of New York DSA chapter and organizers of the Socialist Scholars Conference). 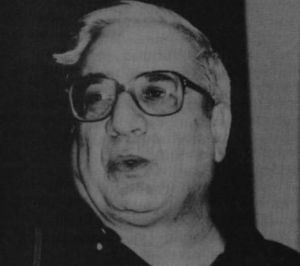 Bogdan Denitch signed an April 2003 Statement on Cuba, initiated and circulated by prominent Democratic Socialists of America (DSA) member Leo Casey, calling for the lifting of trade sanctions against Cuba. Bernard Avishai, Joanne Barkan, David Bensman, Marshall Berman, Paul Berman, H Brand, David Bromwich, Luther Carpenter, Jean L Cohen, Mitchell Cohen, Bogdan Denitch, Jeff Faux, Cynthia Fuchs Epstein, Todd Gitlin, Murray Hausknecht, Agnes Heller, Jeffrey Isaac, Michael Kazin, Martin Kilson, Erazim Kohak, William Kornblum, Jeremy Larner, Susie Linfield, Kevin Mattson, Deborah Meier, Harold Meyerson, Nicolaus Mills, Jo-Ann Mort, Brian Morton, Carol O'Cleireacain, George Packer, Martin Peretz, Anson Rabinbach, Ruth Rosen, James Rule, Alan Ryan, Patricia Cayo Sexton, Jim Sleeper, Ann Snitow, Cornel West, Sean Wilentz, Dennis Wrong. As of 2009 Bogdan Denitch served as a sponsor of New Politics, magazine almost completely staffed and run by members of Democratic Socialists of America. This page was last modified on 7 June 2012, at 06:30.